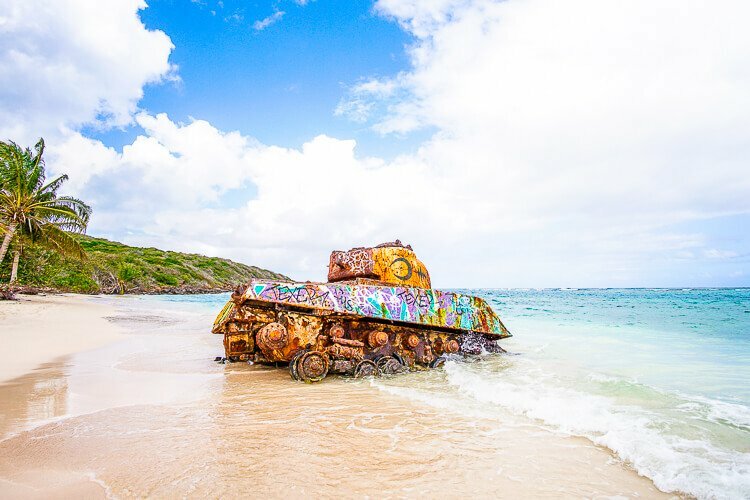 These Tips for Visiting Culebra Island, Puerto Rico will help you make the most of your trip! 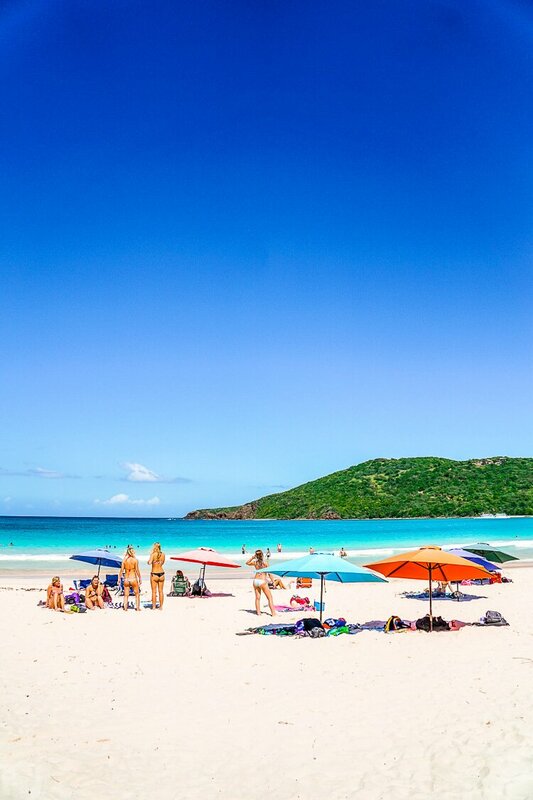 Culebra is the home of Flamenco Beach, one of the most beautiful beaches in the world. 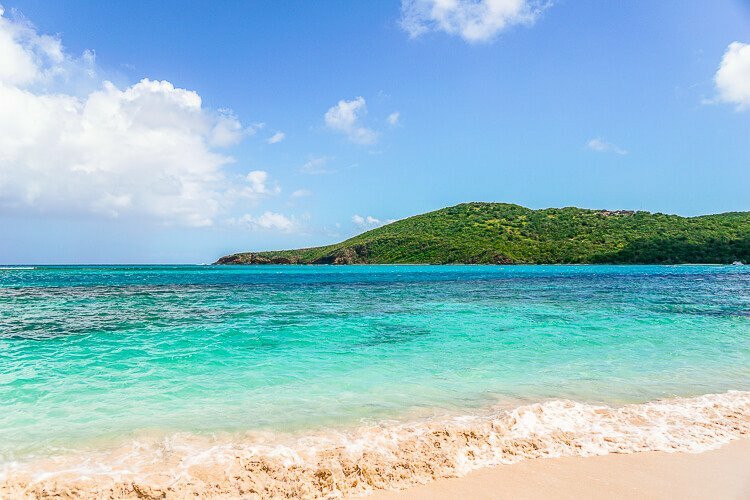 Culebra Island can be accessed in two ways, by air, and by sea. We ended up taking both so we could get the full experience and help you with any questions! So first, let’s talk about the flight options. Buy your tickets with Air Flamenco or Vieques Air Link well ahead of time, with only 10 seats per plane; they sell out FAST! Get to the airport 30 minutes before departure. Book the earliest flight you can. Getting to Culebra by Ferry is the other option. At $4.50 USD per person round-trip, it’s a fantastic price for budget travelers, but there’s a bit of a catch. Parking can be atrocious, and it’s recommended that you get there no later than 1 1/2 hours early to get a spot in the lot and you definitely want to catch the 9:00 am ferry because the next one doesn’t leave until 3:00 pm. The ferry only leaves out of Fajardo, which is about 1 1/2 hours south of San Juan, which could mean a VERY early morning. Alright, so here’s where things get complicated and where most of the ferry’s bad reviews on trip advisor come from, there’s only one booth to pay and get out of the lot. Reviews have said that people have waited for 2 to 3 hours to get out of the lot after returning on the evening ferry… YIKES! So here are my recommendations around that, especially those of you traveling in large groups. Take a taxi to and from the ferry terminal or ask your resort if they offer a shuttle service. If you do bring your car, get there by 7:30 am and park strategically, either close to the booth or close to the ferry, don’t get caught in the middle. On the way back, sit as close to the door as possible so you can get to your car and out of the lot faster. Buy your tickets at the booth ahead of time! We bought ours at the ferry booth a few hours before our scheduled departure and then went and played some more on the island. Overall, our ferry experience was quite pleasant. The ride took about an hour and was fairly smooth since it was the end of the day, most people slept on the way back. We got a ride back to the airport to our car from a taxi, which was $15.00 USD. 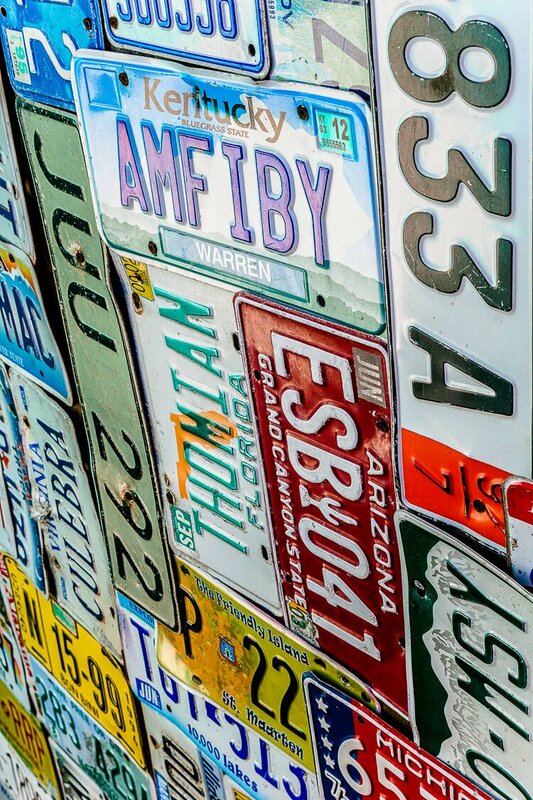 Here’s a site with a great breakdown of estimated taxi fares for Fajardo, it also gives you a list of the local taxi companies. 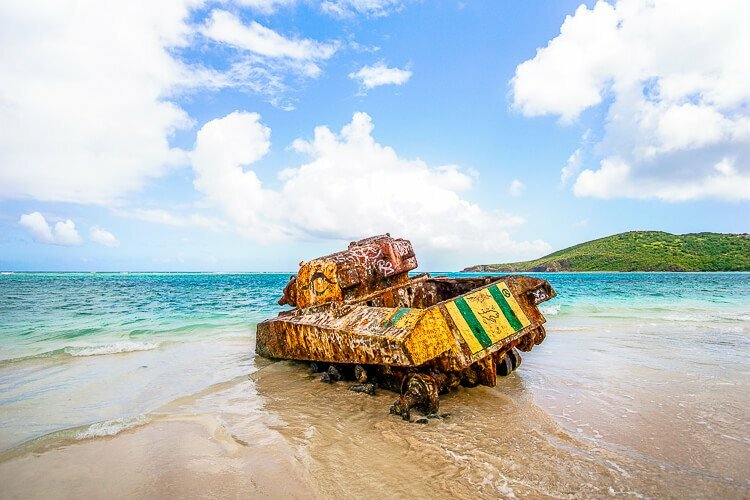 For even more information on the Ferry between Fajardo and Culebra, visit this site. At the airport, we rented a Jeep for $40.00 USD from Carlos Jeep Rental. These are not run-down island Jeeps; they’re new and shiny and super spacious. However, they also rent golf carts for a lower rate, which we would have done but they were out. Pro tip: book it ahead of time! 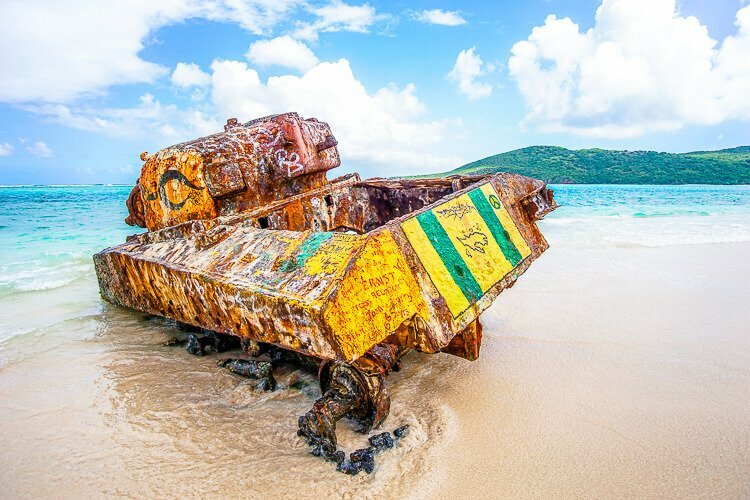 However, there is a shuttle from both the ferry terminal and the airport that goes to Flamenco Beach. The shuttle is $5.00 per person, each way. Which, with four of us, was the same as renting the Jeep, so we did that instead so we could move at our own pace and get to explore a little more of the island. Carlos Jeep Rental has two locations, one right inside the airport, and the other a little ways down the road. They offer a shuttle to and from the ferry. All winter long, I dream about the beach. I used to dream about the beautiful beaches of Anna Maria Island, but now, I’ll always dream of Flamenco Beach. 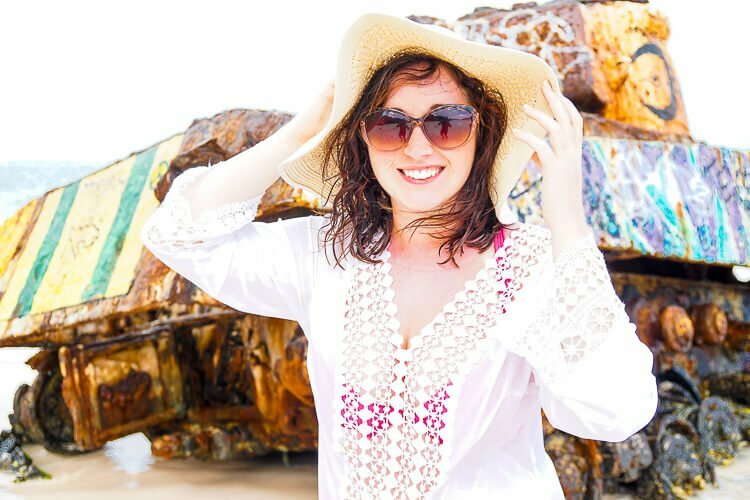 Flamenco is one of the most beautiful beaches in the world, #6 according to TripAdvisor, and once you walk through the trees and out onto the sand, you’ll know exactly why that is. 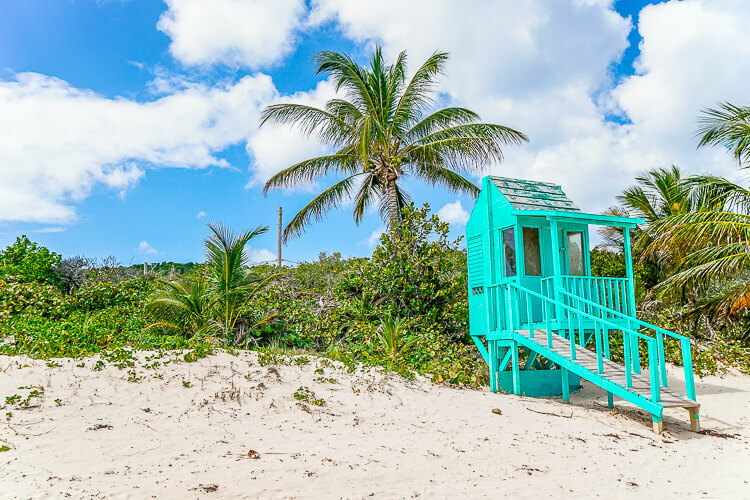 Beautiful turquoise water rolls across the smooth, warm white sand and the green palm trees and mangroves make you feel like you’re in paradise because you are! The beach stretches over a mile within a large bay and boasts gorgeous views with some unique aspects thrown in. 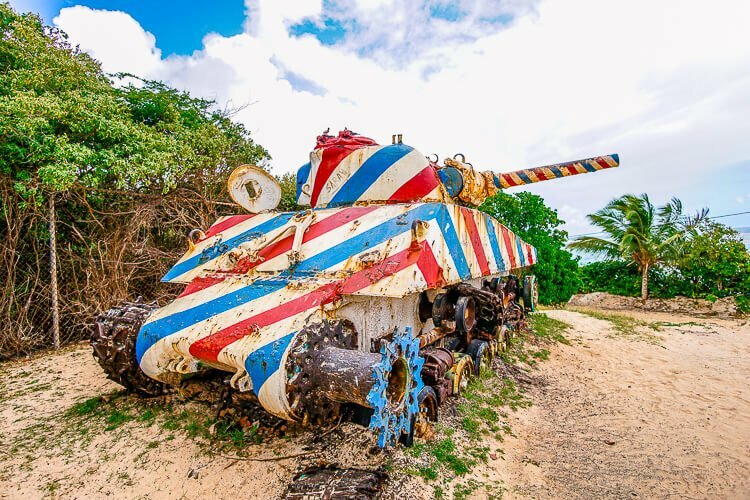 Those unique aspects would be the military tanks left by the United States Navy when they evacuated the island after decades of bomb testing and training. 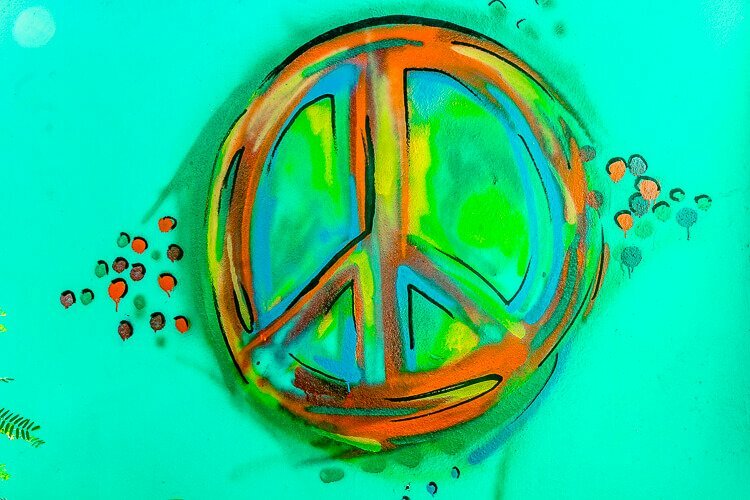 The early 1970s brought about local protests that the military leave, it took about four years of outcry, but the locals prayers were finally answered when the military left in 1975. Four decades later and the reefs have finally begun to rebuild, but these tanks are a reminder of what once was. When the military evacuated and left behind the tanks and other gear, the locals got to work. 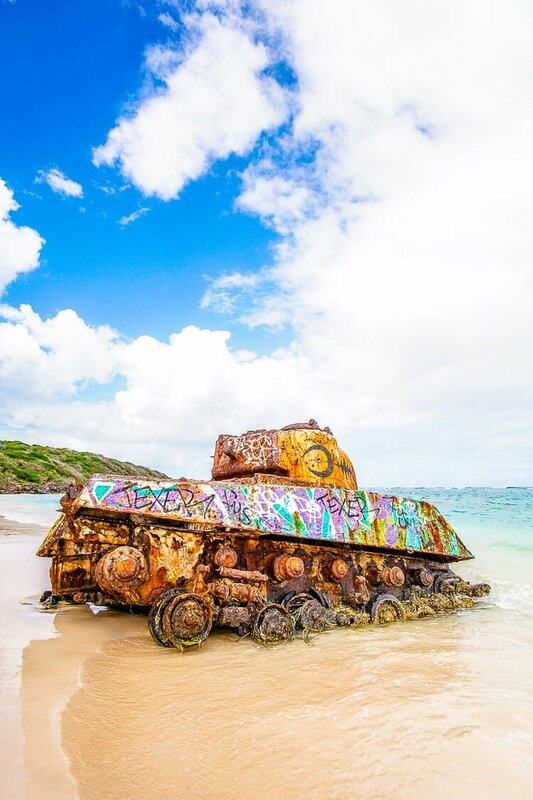 The tanks were too large to move, and they decided to decorate them up and make them a part of the island. 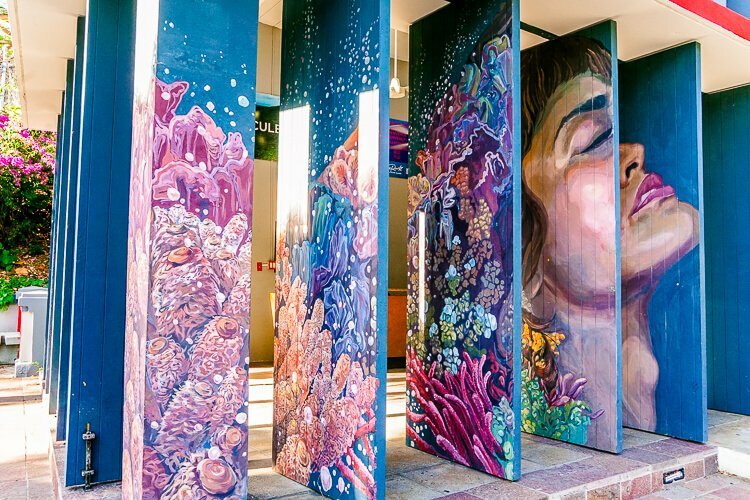 Every few years, new layers of graffiti are added to the tanks to keep them fresh and fun! A unique feature on such a pristine beach. 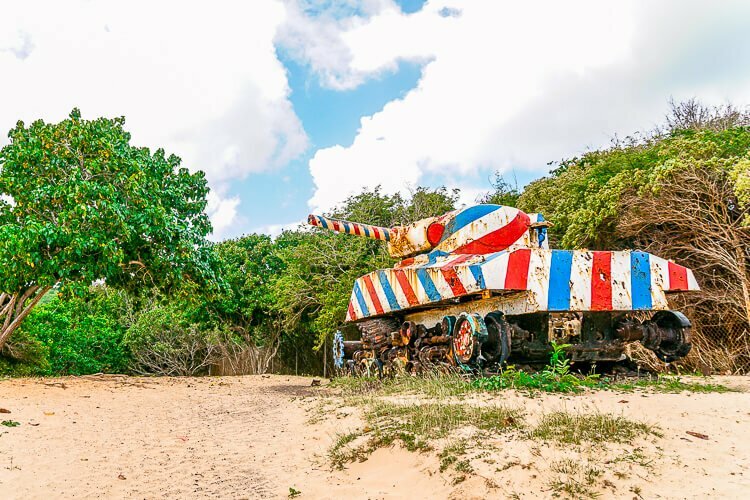 The contrast of the rotting, yet colorful tanks against the impossibly beautiful bay is pretty much a photographers dream, and they were the thing I was most excited to see on my trip to Puerto Rico. After some reading and a swim in the ocean, I decided to take a walk to see them. Imagine you’re walking barefoot on the soft white sand while the water glides over them, your toes sink in, and the cold rush of the ocean tingles against your sun-warmed skin. 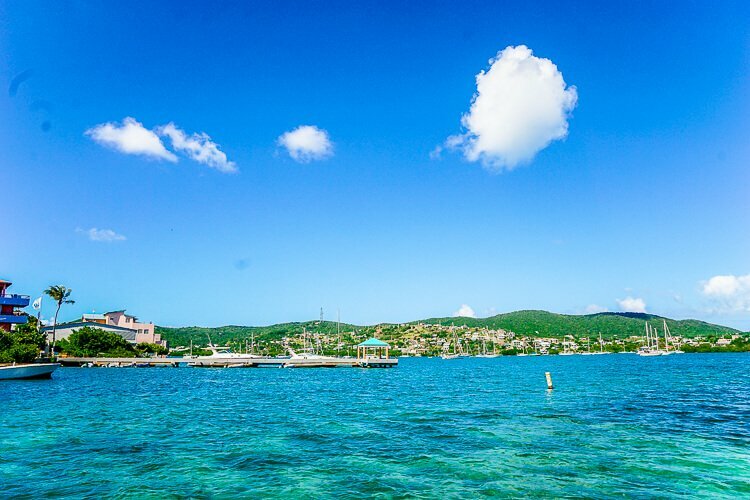 A warm Caribbean breeze brushes your face and threatens to take your sun hat away with it. 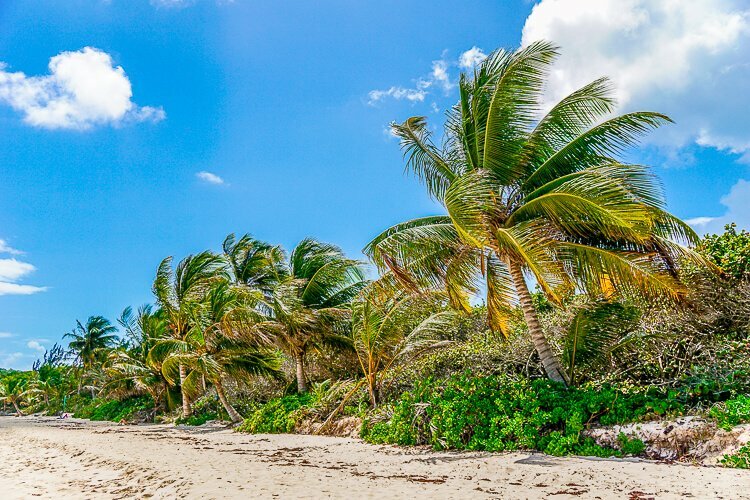 You can hear the chatter of the beach-goers mixed with the Atlantic waves and the hum of the trees, nature is all around you, and you are a part of it. 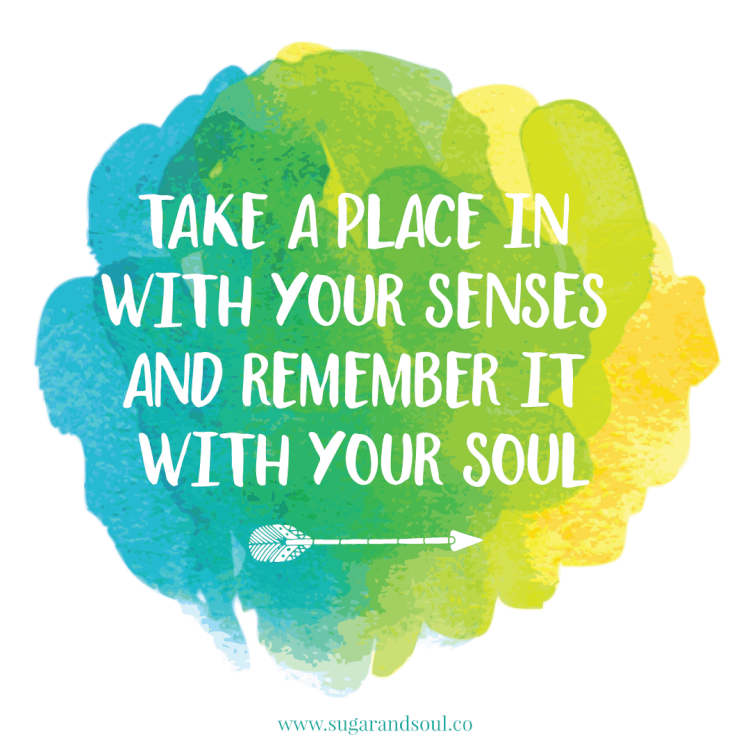 Take a place in with your senses and remember it with your soul. Flamenco is gorgeous, and it’s such a raw bit of nature. You won’t find servers taking drink orders, and you won’t find rows of chairs like you do at more resort beaches… it’s just beautiful! That being said, there are some things you’ll want to be aware of to prep for the best beach day possible! The first being that you’re going to want an umbrella and you’re going to want to get it almost as soon as you get there because they will run out and there isn’t a lot of natural shade on the beach. The umbrella rental truck is not within the parking and dining area, but rather just outside the gate where you would have driven in. Rentals are either $10.00 or $15.00 USD; I can’t remember which, and you should bring cash. They’ll bring the umbrella out and put it in the ground in the location you choose and when you leave, just leave it, and they’ll collect them at the end of the day. The bathrooms are very much camping bathrooms, and most of them don’t have toilet paper. The larger bathroom building had a large roll of community toilet paper that everyone took some of before going in, so you might want to pack your own. There’s also no soap in the bathrooms, so bringing hand sanitizer is a good idea! The Caribbean sun is a powerful thing, and I, unfortunately, found out the hard way when our sunscreen failed on the first day. That being said, put on no less than 50 SPF, preferably 70 SPF, there’s a little shop right next to the parking and dining area that sells it, and though still pricey, it was cheaper than at our resort. Make sure to apply every 90 minutes! I could have missed them, but I don’t recall seeing a single lifeguard on duty, so make sure to pay good attention and be smart when out in the water and know where all the members of your party are. The waves are perfect for body surfing, but they can have a bit of a bite from time to time. You can also buy boogie boards for $15.00+ in the shop. There is a small campground next to the beach, and many people actually live there during the winter months. The campground is run by the government and is extremely safe. You can pitch a tent for $20.00 USD per day for up to 6 people, between the cost and view… it beats the hell out of a lofty hotel bill. 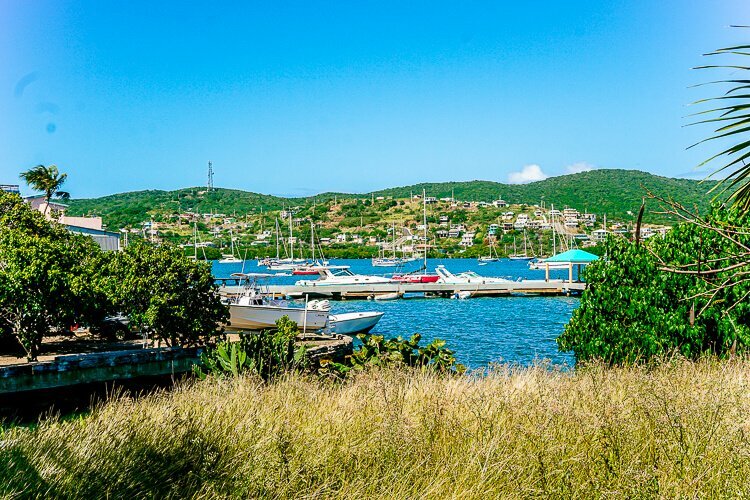 But it’s not for everyone, find out more details about camping on Culebra Island here. 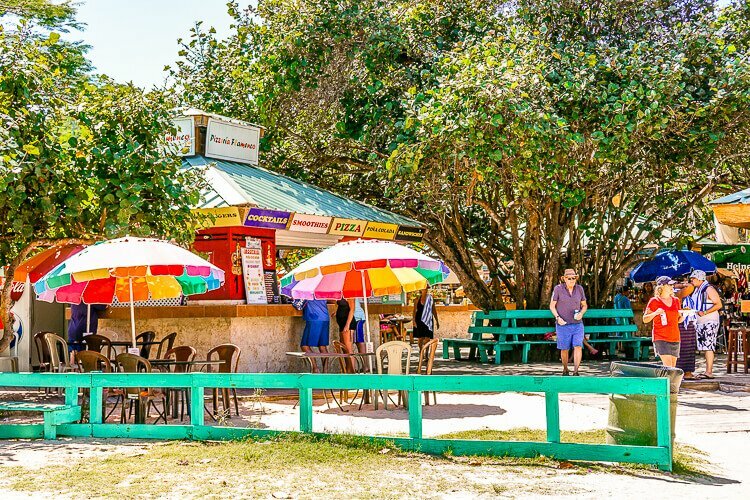 While there are places to grab a bite right next to the beach, we chose to eat off-site. Something about Mexican food sitting under light bulbs didn’t sound promising, and I didn’t want to add food poisoning to my sun poisoning. You can buy packaged snacks in the little shop. However, there is one place you can’t pass up at Flamenco, the sorbet! I don’t remember the name of the company, but you can’t miss the little ice cream cart! 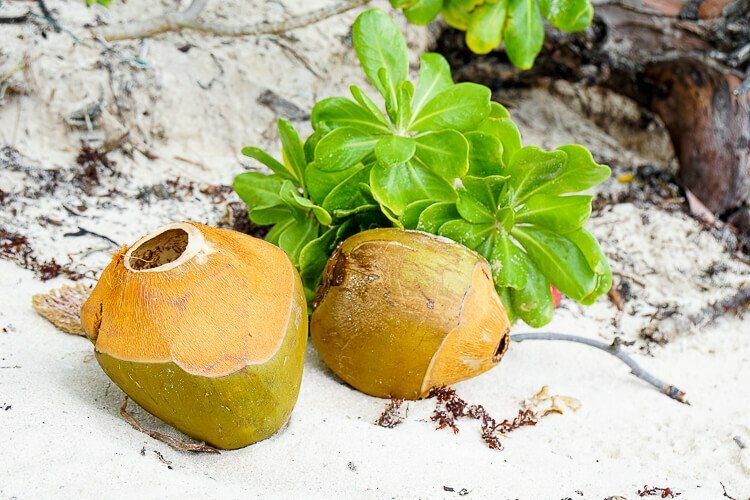 With four ripe flavors – coconut, pineapple, mango, and passion – you seriously can’t go wrong! I got a mix of coconut and mango! But that’s not even the best part; each cone is only $2.00 USD – TWO DOLLARS! It kinda makes you want to get 10! The little sorbet carts are all over the island, so be sure not to leave without getting one and bring cash! One of the nice things about Puerto Rico is that even though it’s not a state, it’s a commonwealth of the United States, which means that US currency is used and most of the people speak English, but not everyone, so it doesn’t hurt to brush up on a little Spanish for the basics before you go! One of the nice things is that only so many people are allowed onto the island each day given that there’s limited transportation, which means nothing is super crowded. The picture above shows you as crowded as it got on the day we were there and that was just in the most saturated area of the sand. 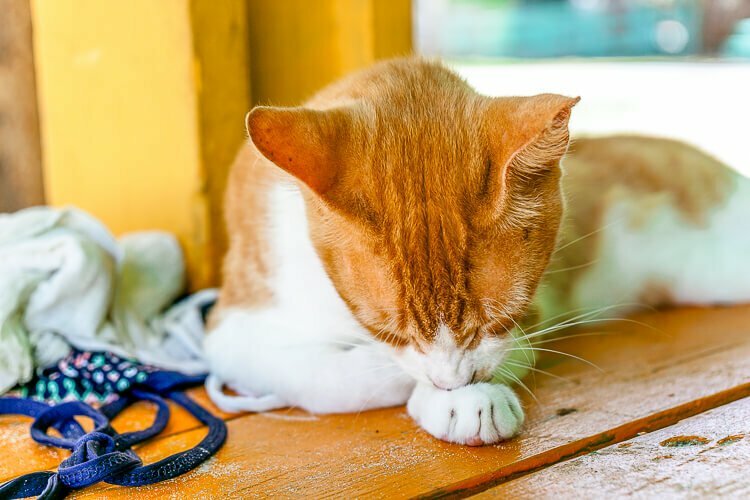 Also, there are cats that run around all over the island, don’t feed them, they’re fed by the locals. 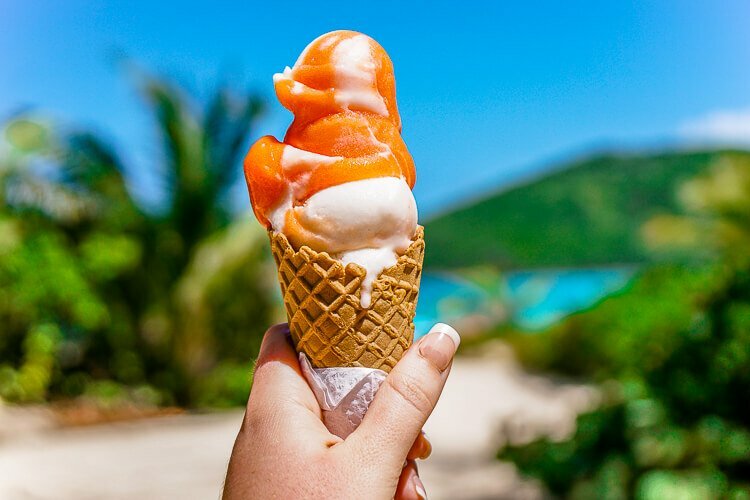 The island itself is very small, and Flamenco Beach is just a short drive from the airport. Because we flew in on the first flight of the morning, we didn’t have to wait in any lines, fight for parking, and pretty much had the beach to ourselves for the first couple of hours. The ferry doesn’t arrive until a little after 10 am, and then it takes time for people to get there. Flamenco is the most popular beach on the island, but it’s not the only one. Tamarindo is on the way to Flamenco and has reefs that are great for snorkeling and spotting sea turtles! Here’s a list of the other beaches on the island and how to get to them! However, Flamenco is the only one we visited. 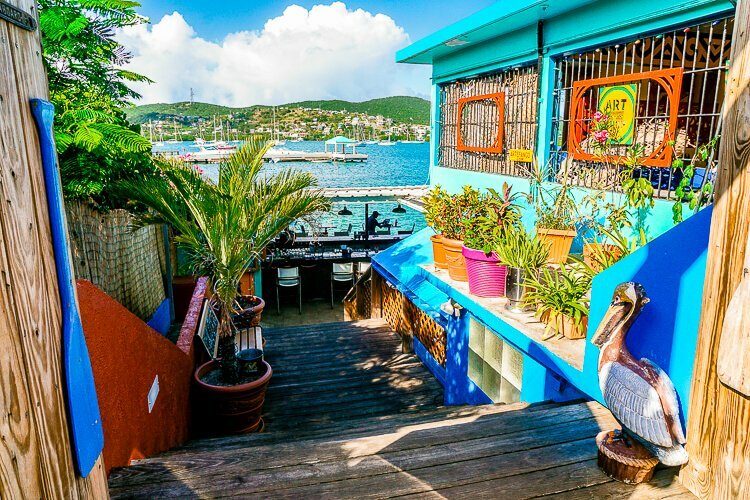 While we were at the airport, we asked for recommendations on where to eat on Culebra Island, and one of the guys recommended Dinghy Dock. I love asking locals where to eat when I’m traveling. 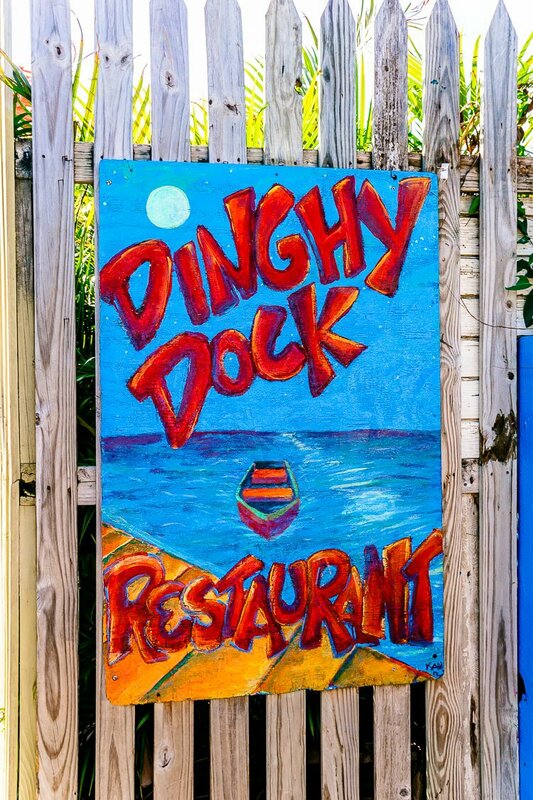 Dinghy Dock was such a cute little place with open seating and a beautiful view of the Culebra Island harbor. 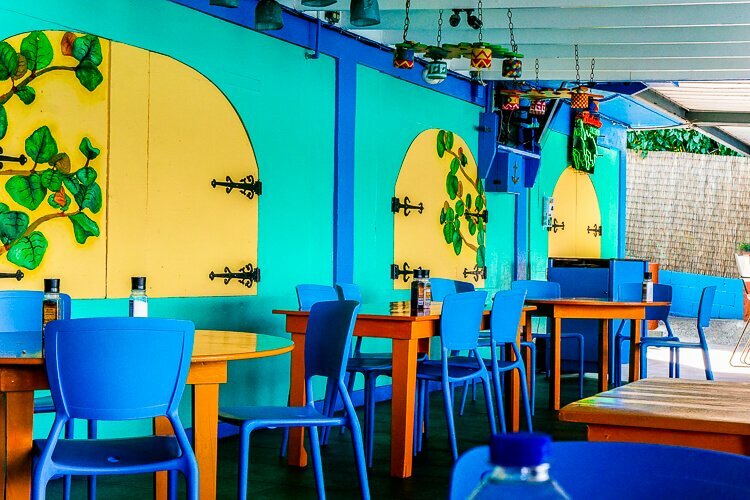 Everything was brightly colored, and the food was good and actually reasonably priced. It definitely felt like a place where the locals go too! The crab cakes are superb! After we were done eating, Rachael from Eazy Peazy Mealz’ daughter fed our leftover meat to the fishies in the water right next to us with our waitress. After getting a bite to eat, we decided to return the Jeep and catch the shuttle back to the ferry. 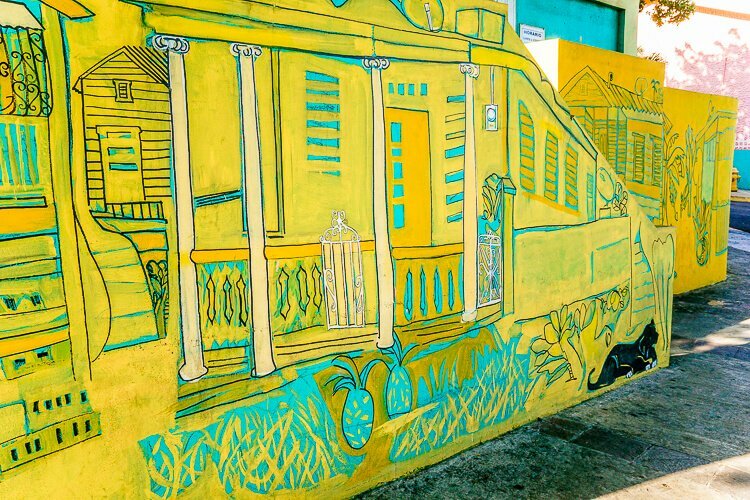 We had a little bit of time, so I walked around to check out the beautiful murals along the street. Then it was time for the trip back to Fajardo. I absolutely LOVED Culebra Island and will definitely be going back. Next time we go, I think we’ll spend a few nights on the island and rent a golf cart to really make the trip worth it. I would have loved to have done some snorkeling while we were there too. 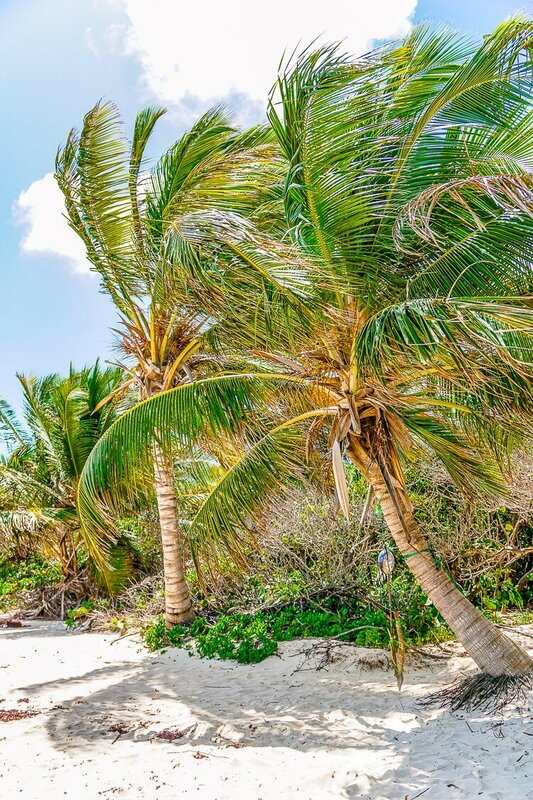 We were on Culebra Island in late February, and it was a beautiful time to go, though I don’t know if there’s really a bad time since it hardly ever rains there and there isn’t much humidity. 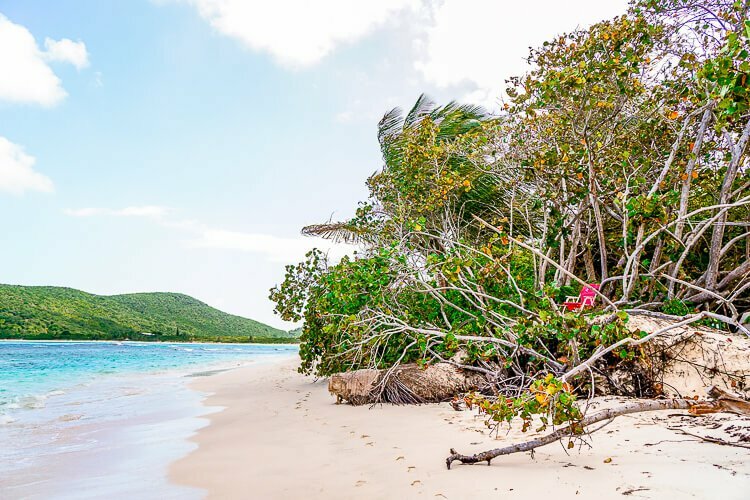 Have you been to Culebra Island? What was your favorite part? Are you ready to jump on a plane and head there right now? I know I’m definitely ready to head back! 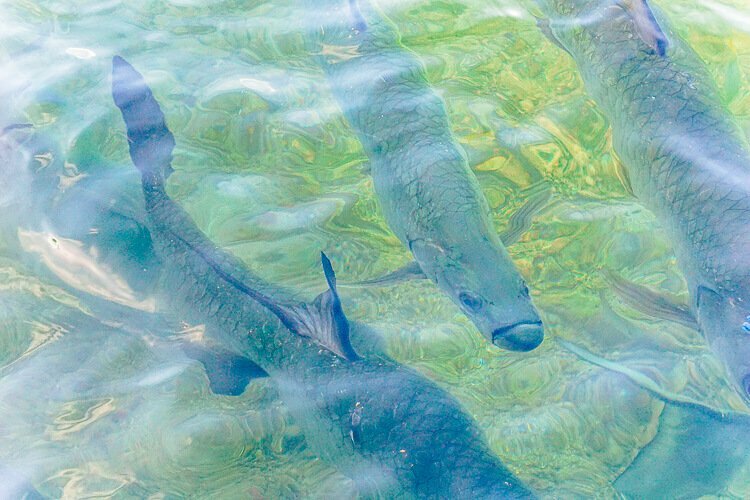 Pin these Tips for Culebra for Later! 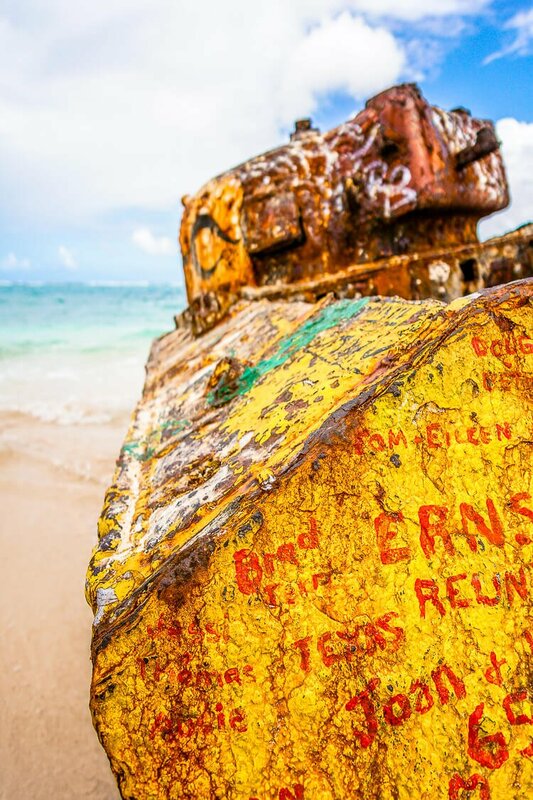 This post was updated February 15, 2017.
ahh I just came back from Puerto Rico and couldn’t make it to Culebra! Reading this makes me want to go back and just stay there the whole visit! Oh, such a bummer, Diana! Culebra is amazing and the next time I got to Puerto Rico I’ll probably camp there the whole time! What time is the last ferry going back to the mainland? Thanks so much for all this information! We are going there in march. I was wondering if you think we could go buy the ferry tickets the day before we plan on going. They charge a lot to buy them online so I was wondering since we are staying super close to it. Thanks! Hi Veronica, Yes, it’s definitely cheaper to buy them ahead of time when you’re there! And that’s what I would recommend doing for anyone who can! You will love it, it’s such a gorgeous island! Hi Rebecca, that ferry ticket site leads to a paypal…is it a legit site to purchase from? Have you tried it? I really love your tips, and the photos are so beautiful! My hubby’s mom is from San Juan born and raised, and he/I are planning a trip to PR mid May. I have a question — which airline did you choose to fly with, and did you book your flight tickets ahead of time? Thank you so much! Hi , Love your information on Culebra! 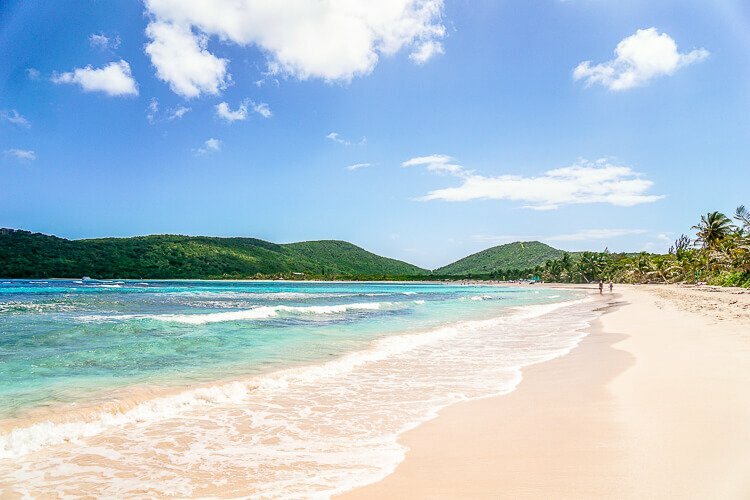 We are heading to Puerto Rico in March (this will be our 3rd trip), and are planning to take our first trip to Culebra. So did you fly one way over there then paid for a one way on the ferry? If so, did you park at airport and then took a cab from ferry to airport? I am assuming its the airport in Ceiba. So will that be open to get our car after cab ride from ferry? Also is there several roads to travel on on the island? We plan to rent from that Jeep place, and would consider a golf cart, if they can go on the roads too. Hi Becky, Yes we flew over and took the ferry back and left the car at the airport. We asked for a taxi number from the airport when we arrived and called and scheduled the taxi pickup for our return to the mainland. The airport should be open when you get there and you just have to take you parking ticket inside to the teller and pay and then they will let you out of the parking lot, the automated machine was broken when we were there but might be working when you go. Personally, I would have preferred a golf cart, but they were out. The golf carts can go anywhere the jeeps can, but they’re smaller and that makes it easier to drive on the narrow roads, especially in the little town. 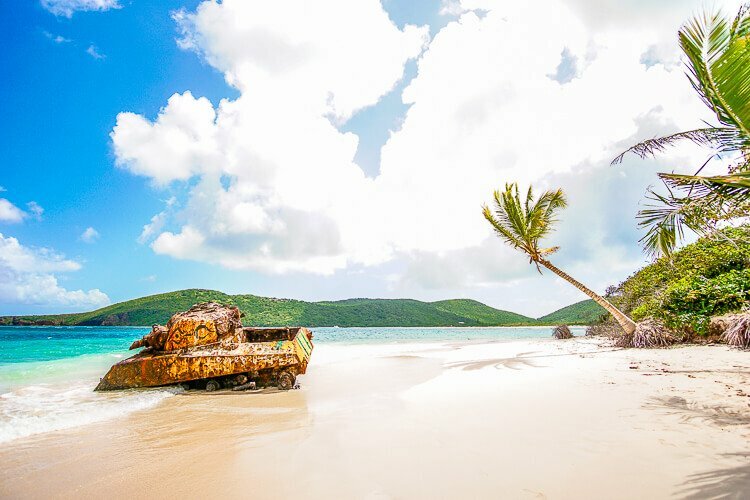 Enjoy Culebra, it’s one of my favorite places I’ve ever been! I just loved this recap of your trip. I was in San Juan in September. 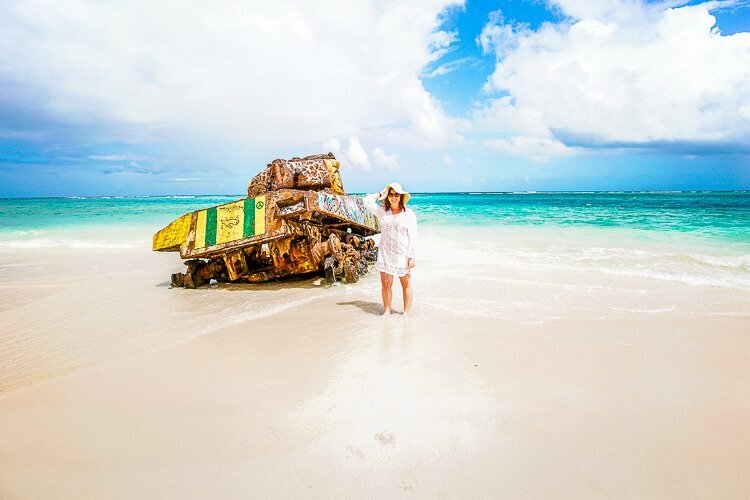 We took a private boat tour for the excursion with a destination bound for Flamenco Beach….. well that was until the boat has a man function and 10 minutes out of the marina we had to turn around. Talk about complete heartbreak. It was our last day of the vacation and Flamenco Beach was my number 1 thing to do. But there is hope, I’ll be back in San Juan next month. I have it all planned to take the small charter plane. Thank you so much for your tips. I just know my pale skin will approach the umbrella tip oh and the TP notification :). The jeep rental suggestion just what I was looking for. Your pictures are so vibrant and colorful. I am even more excited to go, I didn’t think that was possible. Hi Jenn, I’m so glad you’re getting the chance to go again, fingers crossed you don’t have any issues this time around and you get to have a full and amazing day in paradise! 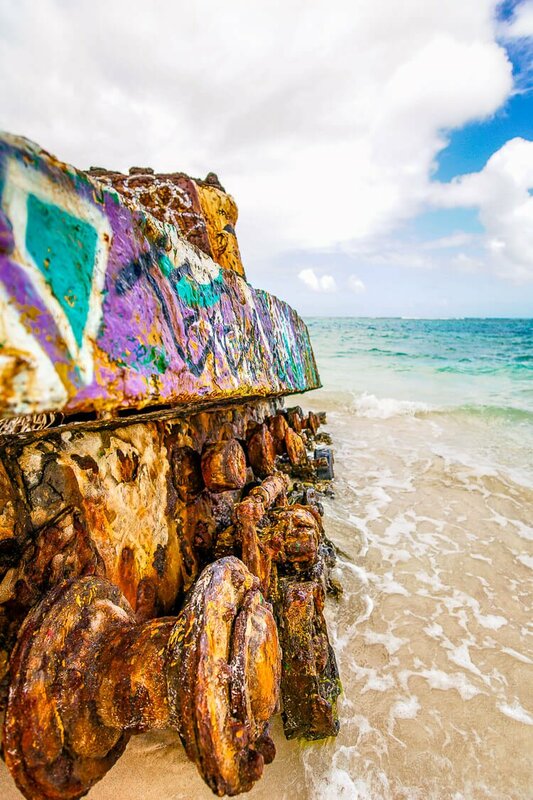 You will absolutely LOVE Culebra! And yes, don’t forget the TP! Have fun! Great article! We are planning a trip in July. We have three kids (9yrs, 5yrs, and 6 months). Is the island kid friendly? I have concerns about the ferry or flight with the baby. Did you see others traveling with young children? Would a golf cart be safe with the baby? Thanks! Hi Lara, I wish I could tell you one way or the other but I’m really not sure. you are definitely fine for the ferry, there were plenty of families on it when we went. I’m sure the plane has similar rules to larger aircrafts in terms of children. As for the golf cart, that’s where I really don’t know. We rented a jeep and that worked great too and might be the safer route. Am heading to PR at the end of the month. Would you consider it safe to bring along my dsl camera and leave it on the beach while in the water at Culebra? Hi Gin, We left ours on the beach in bags, but we tried to keep our eye on our space. I don’t think there’s much crime on the island, and most people on the beach are tourists themselves. I think you’re always taking a risk, you just have to decide if it’s worth it. But I don’t think you are in too much danger of losing your things. Hi Kayla, I’m fully aware that Puerto Rico is not Mexico however, taquitos are.